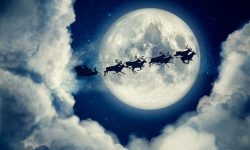 If you're a Christmas Enthusiast gearing up for another great holiday season, you've probably got some decisions to make. And unless you already have on hand all the Christmas lights you'll need, one of those decisions will be very basic: what kind of bulbs to buy. 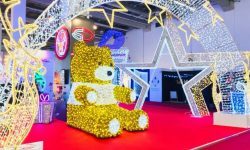 For light lines that are used in outdoor displays, particularly for outlining structures, C9 bulbs - the largest bulb size - is the best choice. And if you'll be buying some C9 bulbs you'll need to decide between two versions of the bulb - retrofit bulbs or stringer sets. A stringer set is a 1-piece unit. 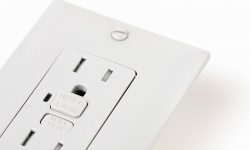 The cord and the bulbs are manufactured as a single piece. That means, of course, that individual bulbs cannot be removed and replaced. It also means that the length of the line is fixed. Retrofit bulbs, however, are self-contained units. Each bulb can be removed or added to the light line as desired. And the bulbs are used with cord that's called empty socket light line. You can cut the empty socket line to any length you wish to create custom light lines. So which is the better choice? Let's see… On one hand you have a fixed-length line that's very unlikely to be the just-right length for any of your light runs. And each of the bulbs in that line can NEVER be replaced. That means that you can't change colors on a whim. And that means that you can't replace any bulbs that happen to go bad. On the other hand, you have a custom-length line that fits perfectly wherever you choose to use it. If a bulb goes out, you can replace it, so that line will serve you for years and years. And you can switch or mix-up bulb colors anyway and anytime you desire. Retrofit bulbs are far more reliable since each bulb is self-contained. Each bulb is an independent unit containing the electronics for that bulb. A retrofit bulb can go bad, certainly. But when that happens you simply replace that one bulb, and your line is back to 100%. But a stringer set is a single unit, with one set of electronics controlling all the bulbs in a line. So if something goes wrong, all of the lights on the line can be knocked out. You're only option then is to discard the line and buy another. And if individual bulbs go out, you have to decide whether to live with the dead spots or throw away the entire line. The choice between stringer sets and retrofits would be a little more difficult if it were an apples-to-apples comparison in terms of visual quality. But it's not. Retrofit bulbs, in fact, are markedly superior to stringer sets in appearance. 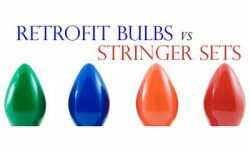 Stringer set bulbs are manufactured with a single diode per bulb. But retrofit bulbs are manufactured with multiple diodes in each bulb - usually 3 to 5 diodes. 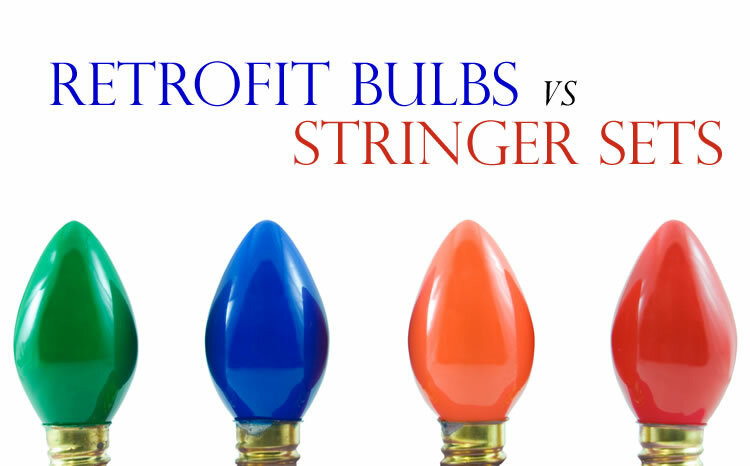 The extra diodes make the retrofit bulbs brighter than stringer set bulbs. Much brighter! As noted above, stringer set lines come in fixed lengths. If you have a 25-foot stringer line, you'll have to make it work as best you can - even if what you really need is a 20-foot line, or 30-foot. But if you're using retrofit bulbs, you'll be creating custom light lines that are the exact length you'll need. If you need a line that's exactly 47 feet and 5 inches, that's what you'll create. It's easy to do. Just measure the cord, cut to length, slide on the electrical fittings at each end, and your line is ready. All you have to do is screw in the retrofit bulbs. And having light lines that perfectly fit each run - instead of a little too short here, and a little too long there - makes a tremendous difference in the overall appearance of a display. No professional Christmas light installer would be caught dead installing stringer set light lines. 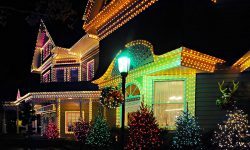 Any professionally installed outdoor display you see, whether residential or business, has been created wutg custom-length lines using retrofit bulbs. Professionals know that a job will look better with retrofit bulbs. That's because of the superior visual qualities of retrofits. And it's also because each run of lights is customized to fit perfectly. But those aren't the only reasons professionals use retrofits. Pros know that the retrofits will also cost less over time than the stringer sets. 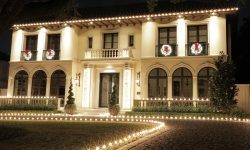 You may not be a professional Christmas light installer. But you want your holiday display to look professional, right? There's no reason that it can't - unless you're using stringer sets. Then retrofit bulbs are the clear choice.